3D printing leader showcases printers for as low as $229 and unveils new smart home and wearable products. LAS VEGAS, Jan. 3, 2017 /PRNewswire/ -- XYZprinting, the world's leading 3D printing company, announced today it is débuting several new products at CES 2017 in Las Vegas, January 5-8. Located in the Sands Hotel, XYZprinting will have demos and products spanning 3D printing, smart home, robotics and more. "XYZprinting envisions a world where parents, kids and professionals are able to easily access and create 3D printed items to enhance home, work and play," said Simon Shen, CEO of XYZprinting and New Kinpo Group. "We believe it is important to break down technological barriers of all kinds by offering easy-to-use devices that deliver innovative experiences at cost-effective prices. At this year's CES, we are broadening our product suite to not only include 3D printers for all parts of your life, but products that extend beyond 3D printed technology – like 'smart' beauty products, wearables and robotics – to provide a broad scope of products that enhance consumers' daily lives." Previewing at CES's Unveiled show Tuesday, January 3 and at Pepcom Wednesday, January 4, XYZprinting will provide a first look at its new products including the da Vinci Nano, the da Vinci Junior 2.0 Mix and the Nobel Superfine targeting the needs of those 3D printing at home, on the go, or at work. Additionally, booth visitors will see more than 10 3D printer models as well as robotics, fitness-oriented wearable devices, smart home health & beauty products and more. 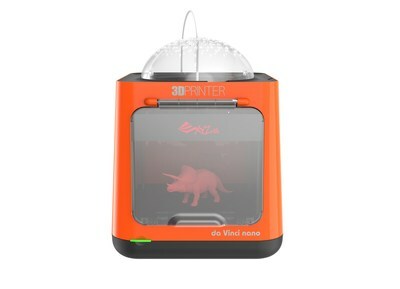 da Vinci Nano: XYZprinting's most compact 3D printer with an expected MSRP of $229.95, the da Vinci Nano is perfect for first-time users who are space-constrained and on a budget. It offers a convenient, one-button printing process and is the ultimate 3D printer for those that value portability, ample desk space, organization, and safety. Available Q2 2017.
da Vinci Junior 2.0 Mix: A 3D printer that easily blends two PLA filaments of any color, the da Vinci Junior 2.0 Mix uses the new dual-feed with the single extruder module to create a print that gradually changes color. Users can experiment with different filament color types and choose from "Multicolor Mode" and "Mixer Mode" in the XYZware software. MSRP $449.95, available January 2017. Nobel 1.0A: A user-friendly professional 3D printer that allows designers to achieve great, high quality results at an affordable price. At $1,999.95, the Nobel 1.0A is one of the most cost-competitive SLA 3D printers on the market. Featuring an X/Y-axis print resolution of 0.13mm and a Z-axis resolution up to 0.025mm, this enables precise details for 3D prints with complex geometries. Nobel Superfine: A highly accurate desktop 3D printer, the Nobel Superfine is designed to achieve superior printing results for users of all skill levels. The device uses a Direct Light Processing (DLP®) projector to cure a photosensitive resin, equating to a print resolution that reaches 25 microns. Equipped with the latest DLP technology, the compact Nobel Superfine is XYZprinting's fastest and most precise 3D printer – ideal for the application of jewelry or prototypes. With an expected MSRP of $2699.95 this is an extremely cost-effective solution. Available Q2 2017. HiMirror, HiMirror Plus and HiSkin: Through its intuitive, touch-free design, HiMirror, the world's first smart beauty mirror, offers beauty and health conscious individuals in-depth, personalized skincare analysis and product recommendations based not only on the evolving condition of her/his skin, but local weather conditions and other factors (HiMirror Basic MSRP $189, Available now). Unveiled today, the HiMirror Plus (MSRP $259) includes the existing features and functionality of the HiMirror Basic, along with LED makeup lighting for five different environment settings and increased memory to accommodate more users and personal beauty tracking. In addition, HiMirror's newest accessory, HiSkin is a revolutionary hand-held device that provides a "skin deep" 360° analysis of your skin's condition including cuticle moisture and subcutaneous pigment precipitation (MSRP $49.99). Both are available January 2017. Smart Body Scale: Paired with the HiMirror, the Smart Body Scale measures weight, body fat ratio (BFR), body mass index (BMI), total body water (TBW), muscle mass, bone mass, and basal metabolic rate (BMR). All data is displayed on a simple and intuitive interface. Available now, MSRP $79. BCX Fitness: Featuring a sensor device and a moderate compressed shirt, the BCX Fitness promises to accurately capture your activity – to a clinical level – while fitting comfortable while exercising. MSRP $ 160/Set. The set includes a transmitter and shirt selection. BCX Zen: A relaxed, tailored clothing that can be used with a sensor device, the BCX Zen provides an experience beyond just physical health. Incorporated into the product is a programmed breath practice guide with the 4-7-8 principle to help users find quick stress relief. The transmitter is specialized in walking detection and identifies a user's cadence spanning walking, jogging or running. BCX Zen is a system that cares for your mindfulness life. MSRP $160/set. Set includes a transmitter and shirt selection. XYZ Board: The XYZ Board is a personal mobility device for everyone including commuters, students and seniors. Edutainment Robot "Diver": XYZrobot's wheeled, multifunctional robot, "Diver", is equipped with a light sensor for easy line-tracking and a wireless camera that takes videos and snapshots from different angles allowing users to take pictures of kids and pets. For more interaction with Diver, the robot uses Scratch, a free programming language for kids, to program LED eyes and its movement. Through built-in IR sensors, Diver is fully controllable through an iOS or Android-enabled smartphone. Available now, $199.99. XYZrobot(Open Platform RobotC-01): An intelligent and autonomous service robot, XYZrobot C01 is a solution for both retail innovation as well as a new marketing model. It roams around a retail space, leading customers to the location or area they are looking for. It intuitively senses when a customer is approaching and engages with a friendly greeting, "Hi, may I help you today", and offers customers the option to use its screen to search for a frequent request, or to connect with a real-time call center service. Available for pre-order in Q1 2017.
da Vinci miniMaker: Featuring auto-calibration, auto-loading filament, and a large build size, the education-focused and kid-safe da Vinci miniMaker is perfect for those seeking to develop core STEM skills. Currently available, $249. 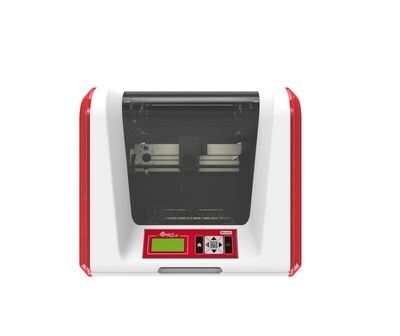 da Vinci Mini: The small, but versatile 3D printer comes with Wi-Fi capabilities and includes USB ports. It is the ultimate, light-weight desktop 3D printer for those that value desk space, simplicity and portability. Currently available, $289. da Vinci Super: For those looking for the capacity to create moderately sized, one-print projects the da Vinci Super meets the need by providing a large build plate , reaching 11.8 x 11.8 x 11.8 inch to accommodate the size of production of everyday Makers. The da Vinci Super is convenient, affordable, and perfect for Makers who wish to build large objects without affecting print quality.MSRP: $1999.95, available Q3 2017.
da Vinci Jr.1.0 Pro: A compact 3D printer for professionals, the da Vinci Jr. 1.0 Pro is compatible with 3rd party 1.75mm PLA filament and has adjustable temperature settings for the extruder nozzle. A 0.3mm diameter extruder is available as a separate purchase add-on for the da Vinci Jr. series and it is perfect for intricate print jobs. It is currently available with an MSRP of $449.95. 3D JET: The 3D JET is capable of printing small, precise objects. The commercial printer has a dedicated print head to print support material, which makes it ideal to print movable parts or for one-print assembly projects. The 3D JET is aimed at engineers, toy makers, entrepreneurs, project designers, and other prosumers that need a 3D printing machine that can build prototypes in great quality. Available Q4 2017. 3PP0A 3D Printer: Perfect for industrial proto-typing, the XYZprinting 3PP0A is XYZprinting's first composite powder, binder jetting 3D printer. Available Q4 2017. 3D Scanner Pro: The 3D Scanner Pro captures full-color, full-sized scans of large objects, including people. Scanned items can be uploaded, viewed, repaired or altered with XYZprinting editing software. MSRP $249. K-12 STEAM Curriculum Gift Cards: Receive access to three exclusive online curriculum projects not found anywhere else best-suited for Science, Technology, Engineering, Arts and Mathematics educators to incorporate 3D printing seamlessly into the classroom. MSRP $49.95. UV Curing Chamber: XYZprinting's UV Curing Chamber is a quick-hardening and energy efficient UV chamber to work in tandem with products printed on the Nobel photosensitive, resin-based printing line. The LED lamp cycles around the printed object every 30 seconds to create a consistent stereolithography. MSRP $399.95. Robotics: In addition to Diver, XYZ will be showing several other robotic products launched throughout the last 12 months spanning an integrated service robot as well as a humanoid robot and a DIY Robot for educational and entertainment use. All available now, the robots range in price from $44.99 - $399. Cal-Comp Bluetooth Speaker: Now you can enjoy wireless stereo audio from a phone or other Bluetooth device such as a computer or a portable music player with the Cal-Comp Bluetooth Speaker with Flash. Cal-Comp External 2bay SSD: A high-performance SATA 6Gb/s 2bay M.2 SSD to USB3.1 Gen2 capable of reaching speeds over 1000/900 MB/s. XYZprinting is frequently recognized for its high-quality products with awards such as TWICE's "Best Pick" award, Digital Trends' "Top Tech of CES" award, Reviewed.com's "CES Editor's Choice" award, PC Mag's "Best of CES" award, COMPUTEX Taipei 2015 "Best Choice" award and Tech & Learning Magazine's "Best of ISTE 2015" award. Its 3D printers have received widespread attention and reviews from the top media influencers in business and technology, including TechCrunch, Forbes, CNET, and VentureBeat. To learn more about XYZprinting at CES 2017 or to schedule a demo at the show, Sands Halls A-D, Booth #42513 in Las Vegas, January 5-8, 2017. XYZprinting, a New Kinpo Group company, is the world's leading 3D printing manufacturer. Dedicated to bringing cost-effective 3D printing to educators and classrooms, consumers and artists, small-to-midsized businesses, and households around the world, XYZprinting has broken down the barriers of 3D printer ownership by providing an easy-to-use device that delivers an outstanding user experience, whether connected to a computer or via mobile. Its printers have won several accolades within the 3D printing industry at major technology industry events and by top publications. XYZprinting currently has offices in China, Japan, Korea, Thailand, the United States and Europe. To learn more about XYZprinting products, view useful tutorials, receive online or phone customer service, and access galleries for free, downloadable 3D designs, please visit http://us.xyzprinting.com.